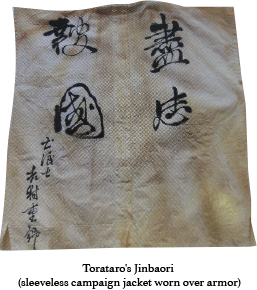 In 1891, The new Meiji Government and Imperial Court specially granted the title of Shoshii (Senior Forth Rank) to Ryoma Sakamoto, Takechi Hanpeita, Shintaro Nakaoka and Torataro Yoshimura as patriots who contributed to the Meiji Restoration. Because of this, these 4 people later came to be called Tosa's Four Heavenly Kings. Torataro was born in 1837 to the villiage headman's family in Yoshiuno village (present Yoshiuno, Tsuno town). At the age of only 12, he succeeded his father as village headman. Around this time he studied under Hanpeita and Soro Masaki, and later joined the Tosa Kinnoto. At the age of 25, he broke with Hanpeita Takechi's idea that the whole Tosa clan should respect the Kinno, and he left the Tosa clan and went to Choshu. His action shocked other patriots in Tosa, such as Ryoma Sakamto, into leaving the clan as well. In 1863 the Tenchugumi was formed in Kyoto and they set out to overthrow of the Tokugawa Shogunate. They attacked Yamato Gojo and Takatori Castle, which was under the Shogunate's direct control. However, because of the August 18th Coup, Tenchugumi became isolated and was worn down in battle, and was eventually destroyed in Higashi-Yoshino. Torataro commanded the Tenchugumi until the very end at Higashi-Yoshino, and died in battle there at the age of 27. Shinsaku Takasugi in Choshu, hearing of Torataro's death wrote "I have countless acquaintances in this world but only Torataro Yoshimura and Yaichi Kawakami know my heart." The Tenchugumi incident informed the public of the need to overthrow the Shogunate, and became one of the triggers of the Meiji Restoration. 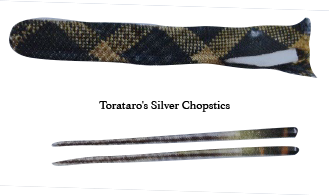 For this reason, Torataro is known as an initiator of the Restoration. Prior to Emperor Komei's pilgrimage toYamato, a vanguard was recruited by Tadamitsu Nakayama (Emperor Meiji's uncle) in 1863 and the Tenchugumi was formed. Tadamitsu Nakayama was the general and Torataro Yoshimura, Keido Matsumoto and Tesseki Fujimoto served as director-generals. The Kawachi and Totsukawa parties joined and it became a large force exceeding 1200 in all. On August 17, The Tenchugumi attacked the Gojo magistrate's office which was under the Shogunate's direct control and increased the rebellion's momentum. However, on August 18, prominent court nobles and the Choshu clan of Sonno Ioi school were expelled by the Satsuma and Aizu clans of the Kobu Gattai school in Kyoto. It was the so-called August 18th Coup. The Emperor's pilgrimage was cancelled, and the Tenchugumi lost big backing in only one day. But they believed there would still be sympathisers who could join the overthrow of the Shogunate.They moved from Takatori Castle to Higashi-Yoshino for the battle, but they were no match for the Shogunate, a large combined army from the Kishu, Hikone and Aizu clans. The Tenchugumi was destroyed. Tadamitsu Nakayama was the only one to escape saved by Shingo Nasu and other suicide squads who charged opponents for him. Torataro, who was catching his breath in a hut in Washiyaguchi, was surrounded by Tsu clan soldiers. He begged to commit harakiri, but was shot dead. Members of the Tenchugumi were buried deep by local people, and there was a never ending stream of visitors even into the Meiji era.